If you’ve been around marketing long enough, you’ve see a lot of shifts in a lot of aspects of the field. And that’s appropriate. The goal of marketing remains the same: sell more product. Oh sure, we have a menagerie of monikers for marketing missions now. There’s branding, demand generation, customer retention, referral marketing, search engine, content, mobile, inbound, experiential, cause and social media marketing – the list goes on. But REALLY, these are all description of marketing tools. And as is the case with all things that progress, change is inevitable. Adapt or die. To succeed at selling more product or services, a company has to differentiate itself from the competition. That means that copying your competition’s marketing is a bad idea. To set your company and it’s product apart from the others on the market, you need to create a really different and compelling customer experience. Experiential marketing is the new branding. Make your customers feel unique, valuable, happy, fulfilled, beautiful, successful, kind, caring, green – or whatever it is you want them to feel in association with your brand. Branding has always been a big part of marketing because of the loyalty that consumers can have to brands they like. So, while a brand campaign may not have the directive to increase a specific metric for a specific product, it very much has the goal of establishing and building the brand so that customers WANT that product. Really, it’s all about psychology. Understanding what motivates people is at the heart of creating effective marketing content. 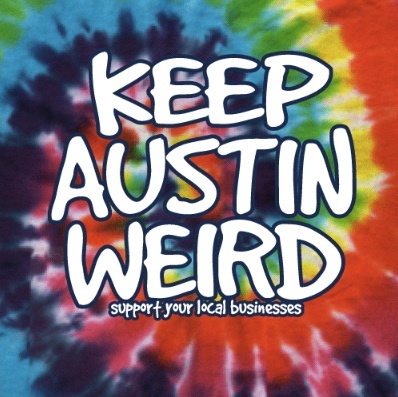 The successful marketing campaign for local Austin businesses “Keep Austin Weird” is an example of great branding and marketing. Successful companies create consumer experiences that pull consumers towards their brand and nurture a relationship with that company. The consumers who identify with and build attachment to the brand are the ones who will buy from the company – and influence their friends and colleagues to do the same. While that may sound a little like sinister mind control, it’s been part of business since the Silk Road was forged. China kept the process of silk production a state secret for over 300 years, which not only kept the competition out of the market, but also increased demand for the exotic fabric. The takeaway? Create a compelling and unique brand, deliver amazing customer experience and your customers will help do your marketing for you. Empower your customers without insulting or alienating them and branding success will be yours.